People have begun fastening safety pins to their clothing, and it all has to do with the victory of President-elect Donald Trump. The Huffington Post reports that in the wake of Trump’s shocking presidential election win, people are wearing safety pins to show solidarity with minority groups who feel threatened. Trump has made controversial statements on the campaign trail regarding Latinos, Muslims, and women. In response, a movement has sprung up among anti-Trump people across the country. The idea of fastening safety pins to one’s clothing stems from the reaction of British citizens to the Brexit vote in their country. Many took to the streets and social media wearing safety pins, to symbolize that they represent a “safe space” for minorities who feel threatened. That trend has caught on here in the U.S. as waves of individuals are fastening safety pins to their clothing to express their desire for a “safe space” for people who feel threatened by a Trump presidency. 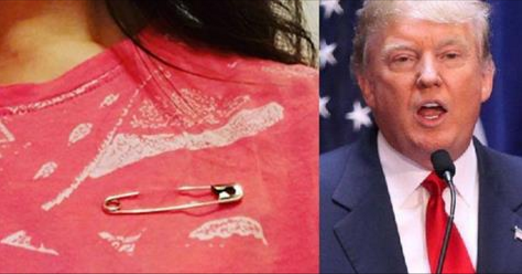 More and more Americans are posting photos of themselves wearing safety pins to social media. On Facebook, users commented on the growing trend.